Washington, DC – Just in time for the showdown leading up to Election Day, RCP and Google Trends have partnered to provide accurate real-time analysis of what will drive voters to the polls this election season. “With just two months until Americans head to the polls, we’re thrilled to partner with RealClearPolitics on this timely and important project. We’ve combined our Google Trends data with RCP’s renowned political polls to help tell a story about this historic election,” said Erica Anderson, Partnerships Manager, Google News Lab. “This is an exciting opportunity to bring our readers more of the numbers and data that they love. We want to put all of the information at their disposal to help readers predict where the country is heading in November,” said Emily Goodin, Managing Editor, RealClearPolitics. Data are based on Google’s search index numbers, which represent the total number of searches for a topic or a keyword divided by the total number of searches in a particular geographical location. 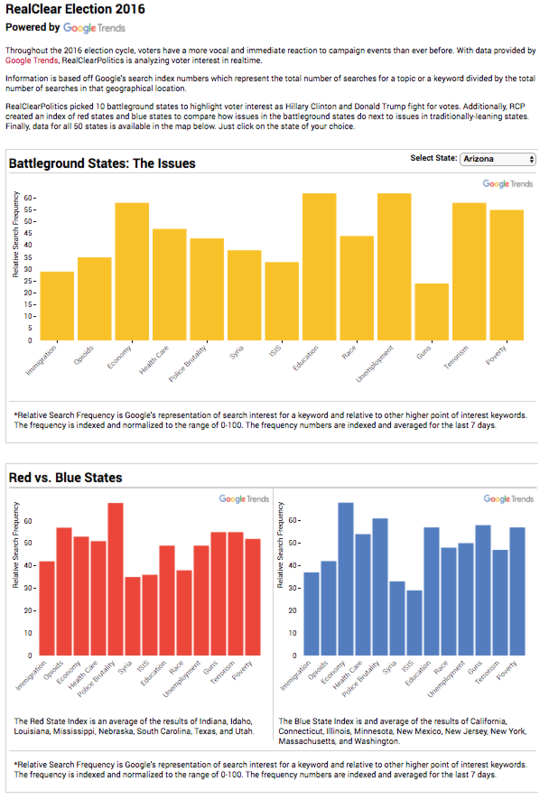 Additionally, this month RealClearPolitics debuted its new editorial series Battlegrounds. The series gives readers valuable insight into the composition of the electorate in key swing states, helping them understand the issues that will decide the 2016 election through original articles and podcasts. RCMG encompasses 15 specialty areas of coverage, including original reporting from our staff of seasoned journalists, live events, the well-known RCP Poll Average, and original video.